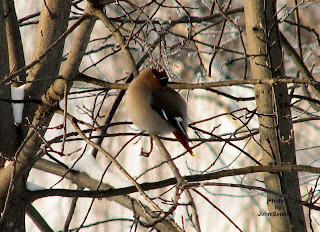 One of the birds that has arrived from the north earlier than usual is the crested Bohemian Waxwing. Small flocks have come in to our backyard frequently to feed on fruit still hanging on the trees from the summer. Unlike their smaller cousins, the very tame Cedar Waxwings, Bohemians are very skittish and even the smallest human movement in a window will cause them to flee. However, unless really frightened, they will return. Even before one can get close enough to pick out their colours and other physical features, Bohemians can be recognized by their behaviour when flying or feeding. In flight, a flock of Bohemians look like stubby cigars with wings barrelling through the air; when perched, they look like a platoon of soldiers sitting in formation facing in the same direction and at the same vertical angle save for one or two "rebels". Once feeding starts they break formation. At a glance the two waxwings are very similar (see Article No. 59) but upon closer examination can be quite easily separated. Around here Cedar Waxwings are summer residents while Bohemians are winter visitors so identification is not a problem, but in the very southern part of our province and in the northern states the two coexist in the wintertime. Here, confusion can result. In mixed flocks the Cedars are noticeably smaller and have much more brown than the greyer Bohemians. Separately, they can be easily differentiated by: first, Bohemians have noticeable white feathering in the wings while Cedars do not; second, Bohemians have a jagged yellow stripe running from the red "wax" spot in the middle of the wing to the tip of the wing which the Cedars do not; third, Bohemians have rich brown under tail coverts while the Cedars have light yellow ones. In the field one seldom gets to see all the characteristics at once, rather usually only two or three will be seen at any one time. For the expert out there, there are several other more subtle field marks that can be used but are not really necessary as the more obvious ones are sufficient. In the accompanying colour photos the last three features are clearly shown. Their vocalizations are different too, but require a bit of field experience to use them effectively for identification purposes. The Cedar has a rather high pitched insect-like zree sound while the Bohemian has a similar but lower and coarser version of zree. If one has fruit trees that keep their fruit over the winter Bohemian Waxwings are almost sure to pay a visit. Some good examples of such trees are Chokecherry, Elderberry, crab apple and especially Mountain Ash (Rowan Tree). They are sloppy eaters and oftentimes leave more on the snow than they eat. There is one rather humourous thing that happens to Bohemian Waxwings from time to time. If the weather is right with spells of warm days in the early spring, some of the fruit will ferment and produce alcohol. When Bohemian waxwings gorge themselves on this fruit they literally become drunk exhibiting all the characteristics of inebriation. Flight is erratic and landing is even more problematic. There have been reports of them actually falling out of trees. One warm March day not that long ago I walked over to my neighbour's place for a visit. 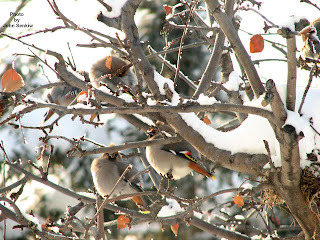 Along his driveway were three Bohemian Waxwings sitting in the snow at the base of a crab apple tree completely oblivious to my close presence. 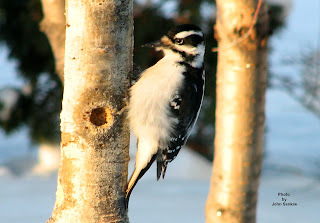 Two of them were fluttering in a deep footprint in the snow trying to but unable to fly out of it. I stopped to watch them for a minute or so only to have them stare back at me with a blank look in their eyes. When I left the house after the visit, the birds were gone. I obviously do not have any proof that they were drunk but there is no other conclusion because they would never have let me approach them so closely nor would they have had any difficulty flying out of a footprint in the snow, unless their mental capabilities were diminished in some way. 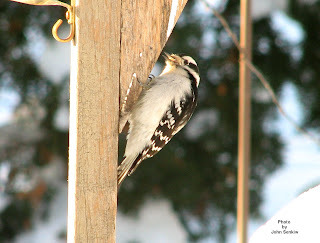 This week's pictures were taken in our backyard. 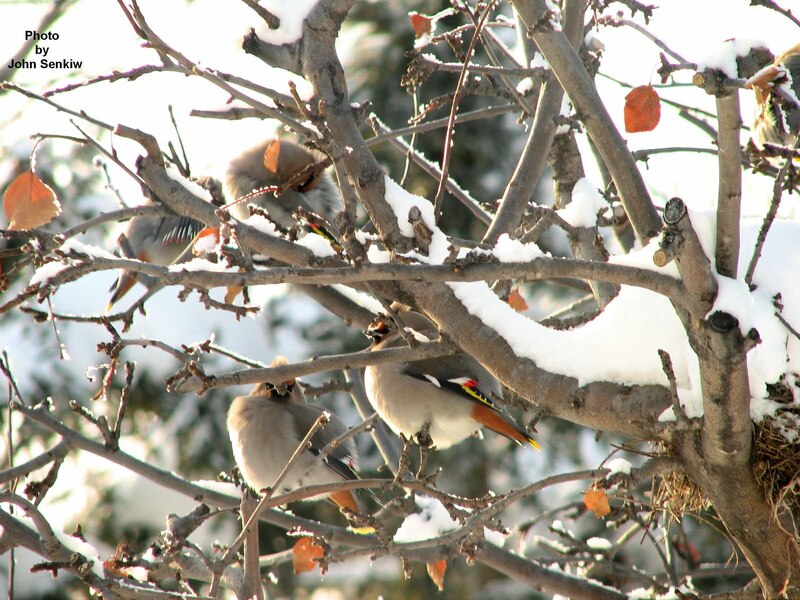 The Bohemian Waxwings were feeding on apples still hanging on our apple tree, and no, they were not drunk. With patience and stealth I took these pictures through the window. The pictures actually came out quite sharp but more importantly, the birds were not scared away as would have happened had I stepped outside to get the shots.